Studied closely, the gritty borders of U.S. Route 1 have a litany of stories to tell, their inspirations lost to progress or the wrecking ball. Like the phragmites reedgrass that grows so well in disturbed soil, the presence of a new strip mall is often a good indicator of something notable that's been replaced. That, at least, is the case on one stretch of road in Linden. On the western side of Route 1, you'll see a large, fenced-off field; the only indication of the enormity of its previous use is the presence of big mounds of milled rubble. Across several lanes of traffic is a big-box mall and multiplex cinema of recent vintage; tall signs declare it to be Aviation Plaza. In true 'blink and you'll miss it' fashion, you might notice one of those small square road signs with an airplane on it, the international designation for an airport, with the word "Linden" below it. And a little farther down, on the eastern side of the road, you might see a larger, but still modest sign saying "Linden Airport" at a nondescript intersection. 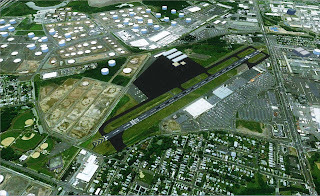 What's an airport doing here, just a few miles down Route 1 from Newark Liberty International Airport? replacing additional runways and older hangars. The airfield and the empty field, as it turns out, share a common history. Between 1937 and 2005, that massive lot was home to a General Motors assembly plant where thousands of workers manufactured vehicles under just about every GM nameplate, from Cadillacs to pickup trucks and SUVs. Soon after the bombing of Pearl Harbor, however, the company's sights took to the air, bringing Linden along with it. In early 1942, GM created the Eastern Aircraft Corporation to take over the production of the Grumman Wildcat fighters for the U.S. Navy. The Linden plant was retooled to produce planes and an airport was quickly built across the highway as a testing and commissioning field. More than 3500 planes rolled off the production line and took to the skies from Linden, built with pride by hundreds of local men and women. Following the war, GM's Linden Assembly plant resumed production of civilian vehicles and its airport found new life. The Federal government deeded the property to the City of Linden under the condition that it continue operation as an airfield, ready for recommissioning for military use in the event of future war. Since then, advances in defensive technology make that possibility highly unlikely, but as the airport's website notes, "back then it was considered a vital part of our military's strategic industrial reserve plan." 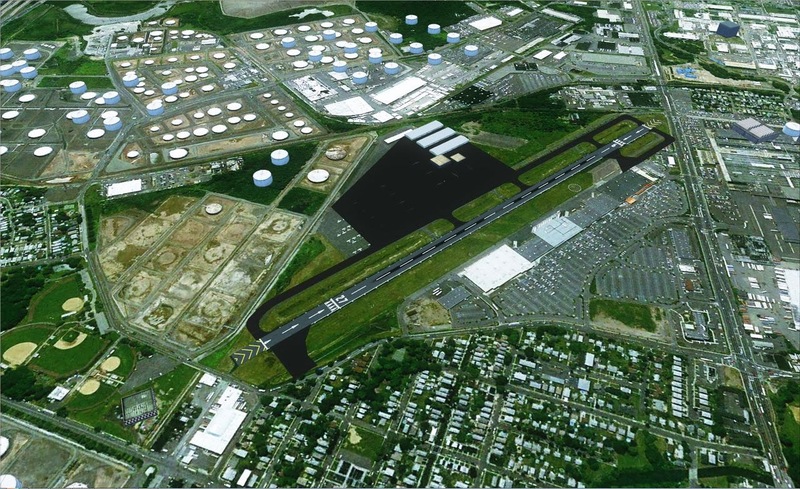 As Newark Airport grew as a regional hub and gained international status, the Linden field became a reliable landing spot for smaller commercial traffic that would ordinarily be dwarfed by passenger and freight jets. Though it lacks a radio tower of its own, New York radio and television news stations continue to count on the now-dubbed KLDJ as home for their traffic helicopters, and hobby pilots can use it as an alternative that's almost as close to Manhattan as Teterboro. The field even hosts occasional events like the Red Bull Air Race, held there in 2010. For historians, however, ghosts of the World War II era field are virtually impossible to find. Present day Linden Airport bears little resemblance to the World War II-era test field, with only one original landing strip still in existence. The old hangars at the north end of the airfield were torn down in 1998 and replaced by newer structures tucked out of sight from Route 1. The rest of the property is now taken up by the Aviation Plaza shopping center and multiplex theater. On the positive side, LDJ has fared much better than many of New Jersey's other airfields-turned-retail locations. Unlike South Plainfield's old Hadley Field, aviators can set down at Linden, do some last-minute holiday shopping and quickly return to the skies. It seems that the ratable-seeking Linden city government may have found the best of both worlds: maintaining its original commitment to keep the field operational for perpetuity while increasing the tax base.